Celebrated arias and ensembles from The Merry Widow, Die Fledermaus, Orpheus in the Underworld, La Perichole and more! Celebrated arias and ensembles from Barber of Seville, Cosi fan Tutte, Carmen, La Bohème, Rigoletto and more! Featuring Natasha Day (soprano), Vivien Conacher (mezzo-soprano), Steven Aviss (tenor), Matthew Palmer (baritone), instrumental trio with arrangements by Jonathan Pease (pianist). A gala music concert and reception with Vivien Conacher (mezzo-soprano), Berrak Dyer (piano) and Elizabeth Bass (harp) – proceeds for the fabric of St Nicholas’ Church, Denston. with Natasha Day (soprano), Alexander Learmouth (baritone), Steven Swindells (tenor), Peter Edge (baritone), and Helen Clutterbuck (soprano). French art songs by Faure, Duparc, Debussy, and Poulenc and operatic arias by Bizet, Massenet, and Offenbach. Accompanied by Panaretos Kyriatzidis. Gala Concert with sopranos: Eleanor Ross, Gillian Ramm, Alice Privett, Breana Stillman and Eleanor Garside, mezzo-sopranos: Sophie Goldrick, Cath Carby and Ailsa Mainwaring, baritones/basses: William Dazeley, Javier Vilarino and Henry Grant Kerswell, and pianists: Krystal Tunnicliffe and James Long. Concert with Alice Privett (soprano), Vivien Conacher (mezzo-soprano) and Berrak Dyer (piano). 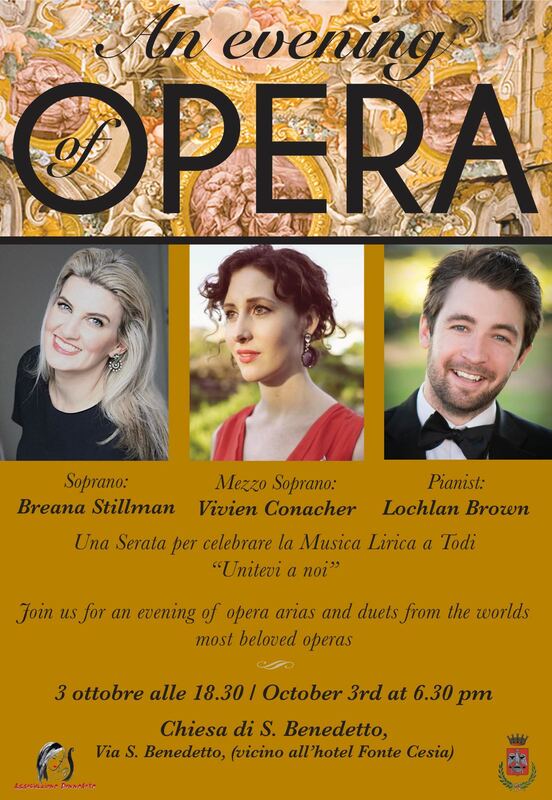 An evening concert with soprano Breana Stillman featuring operatic arias and duets in the hilltop town of Todi in Umbria, Italy. An atmospheric evening concert hosted in a unique loft space in the heart of Shoreditch. Music includes opera, classical song, broadway tunes, and instrumental ensembles. 7:30pm Gilbert & Sullivan Festival, The Royal Hall, Harrogate. 6:30pm Ballroom, Phyllis Court Members Club, Henley. 7:45pm Proms at St Jude’s, London. 7:30pm Vera Fletcher Hall, Thames Ditton. Featuring Natasha Day (soprano), Vivien Conacher (mezzo-soprano), Roberto Abate (tenor), Matthew Palmer (baritone) and David Malusa (pianist). A festive Songhaven concert (for people living with dementia and their carers/companions). Featuring Monica McGhee (soprano), Vivien Conacher (mezzo-soprano), and Juliane Gallant (pianist). Celebrated arias and ensembles performed by Natasha Day (soprano), Vivien Conacher (mezzo-soprano), Aidan Coburn (tenor), Samuel Oram (baritone) and David Malusa (piano). Featuring: Gareth McLearnon (musical director/flute),Nicky Spence (tenor), Jenny Stafford (soprano), Vivien Conacher (mezzo-soprano), Julien Van Mellaerts (baritone), Natasha Day (soprano), John M Savournin (baritone), Peter Foggitt (piano/organ), Mina Beldimanescu (piano), Mary Reid (harp), Behn Quartet (string quartet), and The Malcolm Arnold Academy Chapel Choir. An evening celebration with music, festive food and beverages, and carol singalongs! Concert with Nazan Fikret (soprano), Vivien Conacher (mezzo-soprano) and Berrak Dyer (piano). “Impressionism in Music”: A programme of French chamber music by Debussy, Caplet, and Ravel – presented by Concordia Foundation. William Vann (pianist, presenter), Vivien Conacher (mezzo-soprano), Sofia Castillo (flute), Raphael Lang (cello). Shadow Opera explores 150 years of cabaret music in several immersive vignettes that combine live performances with new short films. Vivien sings Weill and Britten, in a programme that also includes songs by Berg, Satie, Poulenc, Bernstein and Schoenberg. Also featuring Sofia Troncoso (soprano), Patrick Terry (countertenor), Tom Floyd (piano), James Long (piano), and Frieda Love (cabaret artist). Programme of Wagner arias and ensembles performed by Stuart Skelton, Deborah Humble, Catherine Carby, and Liane Keegan with Awardees of the Tait Memorial Trust as supporting artists. Almost Like Being in Love: Songs from Stage & Screen with Dominic Walsh (tenor) and Chad Vindin (pianist). Moonstricken – Songs about Love, the Night, and Madness. Lunchtime Concert for Concordia Foundation, accompanied by Chad Vindin. A programme of opera, musical theatre, and popular songs from the past! Celebrated arias and ensembles from Barber of Seville, Cosi Fan Tutte, Carmen, La Bohème, Rigoletto and more! Featuring Natasha Day (soprano), Vivien Conacher (mezzo-soprano), Aidan Coburn (tenor), Samuel Oram (baritone) and Veronika Shoot (pianist). An evening gala concert with delicious food from Black Olive Cooks. A landscape-inspired programme of folk songs, tunes from the stage & screen, and more! “Waltz of my Heart”: A dance-inspired programme of waltz songs, tunes from the operetta stage, and more! A concert for the Tait Memorial Trust featuring a selection of passionate art songs, arias, and instrumental works. Programme features music by Bizet, Poulenc, Gershwin, Rogers & Hammerstein, and Schumann. A Valentines Day themed concert featuring famous operatic arias, love duets from the classic musicals, and some Gilbert & Sullivan comedy for good measure! Concordia Foundation Recital with Benedict Lewis-Smith, piano. An afternoon of songs, arias, and ensembles performed by Pacific Opera alumni and friends, led by Artistic Director Simon Kenway on piano.